Visit Alaska and Find Beauty Inexpressible - S&K Technologies, Inc.
“I ended up standing about 61/2 to 7 feet from a Kodiak Grizzly.” Michelle Gill. Here is a delightful story from one of our employees. Michelle Gil is a Contract Support Administrative Assistant with S&K Global Solutions and sent us this account of her trip to Alaska from last summer. Enjoy! From the moment I boarded a 737 (one of eight modes of transportation to get to my destination) to the first white-knuckled, sea-sprayed skiff ride, I felt like I lived in a dream. Nothing, not even the realities of bathing only twice in eight days and ‘marking my territory’ in a patch of sea grass, dispelled the watercolour surrealism. Don’t believe what you hear about Texas ~ everything is bigger in Alaska. The snow-draped mountains of the Alaskan Range make my Blue Ridge and Shenandoah look like ant hills. The ice cold, hazel gaze of Uyak Bay is more seductive than Caribbean blue. The air and the wind and the waves and the rain taste sharper, strip you bare, and caress you deeper, than any you might encounter on either the West or East Coasts. This shouldn’t surprise you ~ the Last Frontier is bigger than Texas, California, and Montana combined ~ twice the size of the Lone Star State. And the beauty. My God, the beauty. Everywhere you look, in any direction, there is nature, in all her raw and aching glory. It tightens the chest, fills the soul until you are overwhelmed and breathless, leaves you spent and satiated. It is almost too much. And yet, never enough. On two occasions, our small band of writers and adventurers sat spellbound in the skiff, clinging to humongous bins filled with the sloshing remnants of ice, sea water, and fish guts. Our cameras snapping madly, we watched hardy Alaskan fishermen haul up their purse seine nets for their third or fourth salmon catch. The sun gilded the hair on their brawny arms, muscles bunching and straining against the heavy fish and gravity. Knowing that purse seiners go out and do these “sets” as many as twelves times, my heart ached to see jelly fish outnumber the salmon when the net made its final burst from the sea. Even “pinks,” salmon that is not as tasty as the “reds” that run in May and June, and the “silvers” that run through September, would be a better catch than jelly fish and bull kelp. 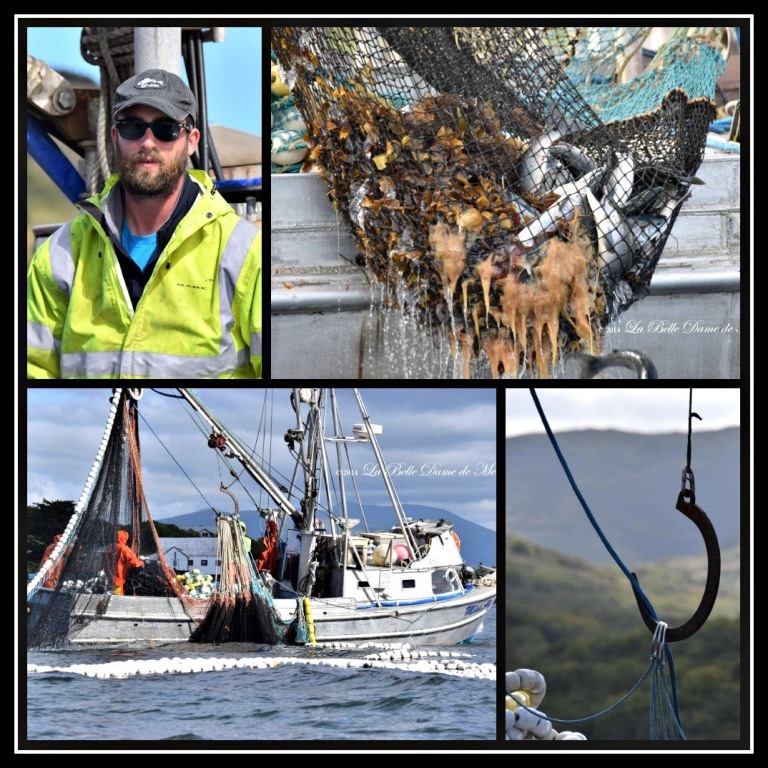 Working in much harsher conditions than your average postman, “neither snow nor rain nor heat nor gloom of night” nor sleet, hail, or hurricane-force winds stays these stout-hearted men (and a few women) from their self-appointed fishing rounds. 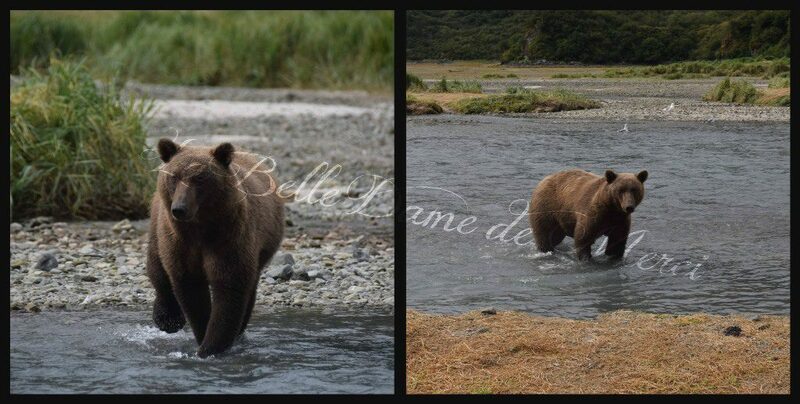 Collage of photos from Katmai. Courtesy Michelle Gil. Sitting in that gently rocking skiff, shooting moments of a life that most in the Lower 48 romanticize, I wondered, “What in the world draws and keeps a man to this kind of life?” Some have never known anything but life on the water, picking fish with their fathers from a young age. Some come to it as a second or third career, some as a hobby. Yet they all feel the pull, the siren song of the beauty of this at times forbidding tundra. You cannot come here, live here, sleep here, without being affected by it. And you certainly cannot leave here without your heart breaking a little at the goodbye. This is the real reason I believe they stay ~ the blood that pumps through their veins is mixed with salt-water, fish oil, and sea air. 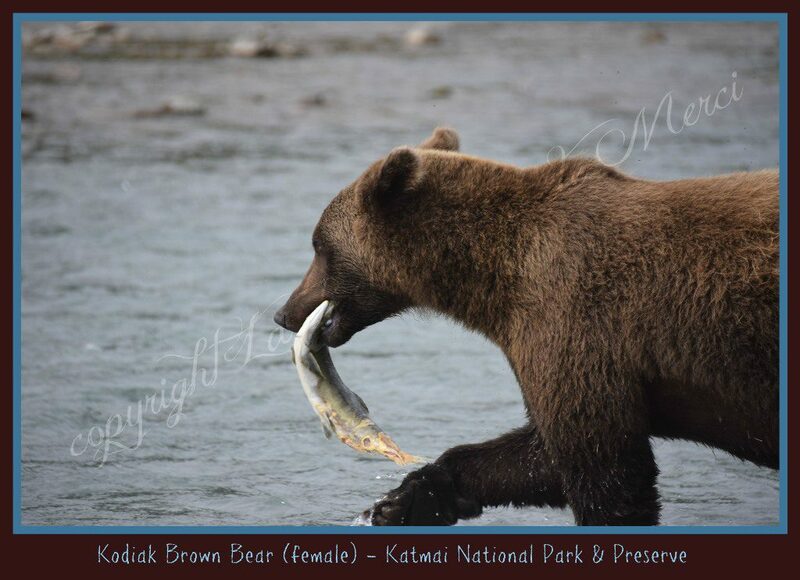 Brown bears on the loose in Katmai National Park. Photos courtesy Michelle Gill.